The Fax Demodulator and Fax Decoder software is used in fax lawful interception and other legal fax decoding applications to convert facsimile audio signals to image files. 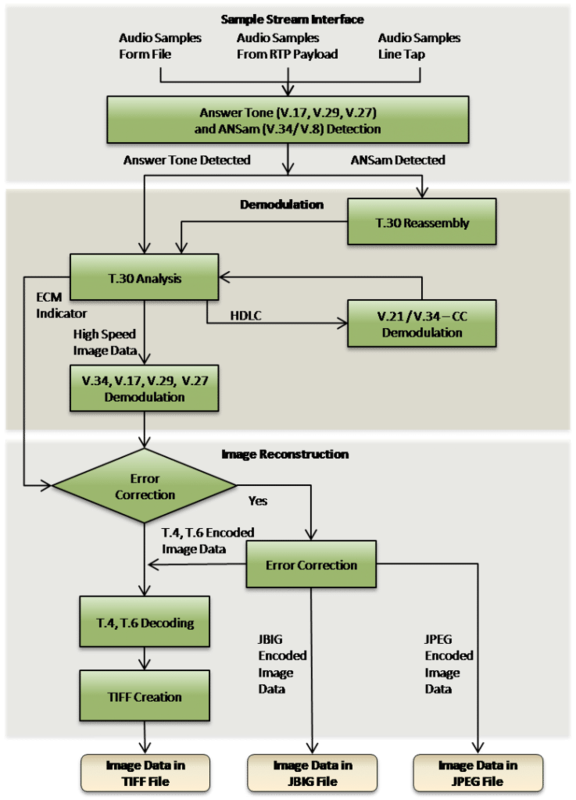 VOCAL’s fax software decodes images for Group 3 Fax including V.34 fax and V.17 fax communications from recorded files and real-time PSTN signal sources. 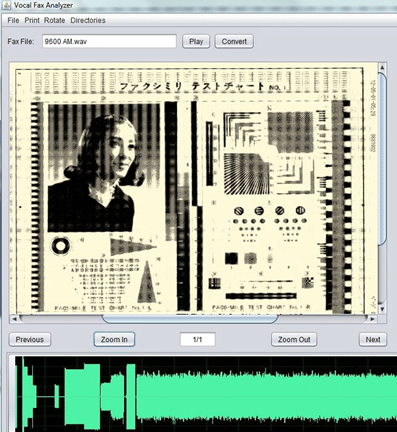 The fax demodulator and image decoder can operate at multiple sample rates, including 16 KHz, in order to ensure the highest input signal quality. Our fax software library may be also used with our FoIP lawful fax intercept. VOCAL’s Fax Demodulator and Fax Decoder software library source code is optimized for DSPs and RISC/CISC processors from TI, ADI, Intel, ARM and other leading vendors. Custom lawful intercept and legal fax demodulation and decoding solutions are also available. Contact us to discuss your fax lawful interception, demodulation and image decoding needs. To assist with embedded development, all combinations of the above modulations, protocols, and features are supported. This allows for optimal use of resources in embedded systems where processing power, memory, or even connect rate are limited. Fax demodulation and image decoding software includes the facsimile monitoring module which supports both standard facsimile as well as machines that make use of manufacturer specific T.30 ‘Non-Standard Facilities’ (NSF) features. For recorded files using low-speed fax demodulation, an auto-detect mode that does not rely on FSK frames is also available. This allows for fax demodulation using NSF negotiation or where control data may not be readily available. The fax image decoder ensures accurate image recovery through the use of blind data retrieval and consistency checks, thus avoiding possible compatibility issues with non-standard facsimile machines. For successful fax decoder processing, it is preferred that the connection is recorded from the beginning of the call. Connection speed is typically negotiated between the sender and receiver at or near the beginning of a call session. Unless some form of blind demodulation is used, an external probe must decode this negotiation in order to properly set up the fax demodulator. The recorded analog signal should have 15 or more bits of resolution and be sampled at an 8 KHz or higher rate. For the V.34 FAX recordings, a sample rate higher than 8 KHz is recommended in order to ensure the highest available input signal quality. Captures from digital (T1/E1) streams are also acceptable. Either a 2- or 4-wire tap may be used to collect PCM samples. All supported facsimile modes use either exclusively half-duplex transmission, or in the case of V.34 fax use split-band signaling. For recording devices, all automatic gain adjustments, VAD, or any other options that might introduce non-linearities into the signal should be disabled. The data recording should be as close to that seen by the receiving machine as possible. If the recording device is not negotiable and has undesirable properties, VOCAL may be able to create a special purpose front-end to correct for specific types of distortion. The recorded file processing interface for the fax demodulation software provides simplicity of integration and ease of use. Callback support during file-based operation is also available. For non-real time processing, the standard supported file formats are Microsoft WAVE (mono/stereo, ulaw/alaw/16 bit linear, 8khz/16khz) and 16 bit linear PCM. Not all .wav formats are supported. Stereo recordings are assumed to be from a four wire tap; mono recordings are assumed to be from a two wire tap. Additional interfaces, rates, and custom data formats can be provided as required for your application. The fax decoder output file format, either TIFF or the standard Microsoft bitmap format (bmp), and can be selected for a specific implementation. Images written in these formats should be readable by most image manipulation utilities. Support for alternate page naming mechanisms is available on request. For page image data, typically one output file is created per page, named in increasing numerical order, and extracted from the recordings. A logfile of each fax demodulation session is also available to assist with debug and analysis. A short summary report file is produced specifying the input file, caller ID, and for each page: width, length, resolution, ECM mode, modulation and compression. Function callbacks are also available for direct extraction of page and T.30 data enabling the Fax Demodulation software to work as callable libraries or in specialty embedded applications. These interfaces may be customized to suit your needs; please contact us to discuss your API requirements. VOCAL’s optimized software is available for the following platforms. Please contact us for specific fax demodulator and decoder supported platforms and performance data.